Not just because of Nick Jonas, Priyanka Chopra took an exit from Salman Khan’s ‘Bharat’ for various reasons. Priyanka Chopra joins Chris Prat in ‘Cowboy Ninja Viking’ is the most convincing reason for leaving Bharat. Quantico actress Priyanka Chopra have recently been in news for different reasons. From her love life to engagement, a secret meeting with her BFF Meghan Markle in London to sudden exit from Bollywood movie ‘Bharat’. The dusky actress is been living her king size life on her own terms and creating abuzz for numerous good reasons at international level. Priyanka Chopra have nabbed another female lead role in Hollywood against Chris Pratt. 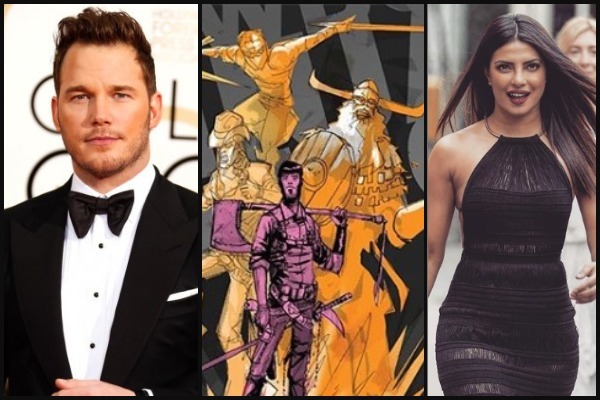 Priyanka Chopra joins Chris Pratt in ‘Cowboy Ninja Viking’ under Universal Pictures banner. Priyanka Chopra beat out a slew of talent after successfully auditioned against Chris Pratt and nabbed herself a leading role. Game of Thrones director Michelle MacLaren will direct the movie which is based on Image Comics graphic novel by A.J. Lieberman. The movie will transform a comic story on big screen which revolves around an intelligence unit run by psychotherapist, who can transform his agent into three different personas: a cowboy, a ninja, and a viking. Obviously, Pratt(Duncan) will play the agent role who can transform into three different personalities. Talking about Priyanka Chopra, She will play the character named Sara Nix, a psychologist who’s assigned to monitor Duncan (Chris Pratt) and who may or may not develop feelings for him despite the professional nature of their relationship. Priyanka Chopra had recently finished shooting the final season of Quantico and was seen in “A Kid Like Jake.” Her upcoming comedy movie “Isn’t It Romantic” is alongside Australian actress Rebel Wilson. Priyanka Chopra, Ekta Kapoor Among Variety’s Top 500 Influential Business Leaders! Knowing Priyanka Chopra she is extremely professional when it comes to career. She did shot for a film just a few days after her dad passed away. So it doesn’t fit well that she got engaged to Nick Jonas and hence took an exit from ‘Bharat’. We believe the concrete reason is more. Subscribe and Follow Eventznu on FB for all the latest Bollywood News and Fashion.